A lack of good judgement cost the Sox last night. Dempster should hope it doesn’t have lasting consequences. I want to point some things out that Ryan Dempster might have forgotten last night. Your team is 8-9 in August and 15-14 since the All-Star Break. You, personally, are three games under .500 with an ERA approaching five (4.77). Most importantly your team is only one game up in an American League East that is home to the talented Tampa Bay Rays and Baltimore Orioles; both of whom are eager to avoid a Wild Card fate. This was before the Yankees took two of the three games from you over the weekend (in Fenway) and suddenly find themselves in the midst of playing their best baseball of the season (winners of seven of their last ten). So why on earth would you allow Alex Rodriguez to get under you skin? For me its pretty simple: Dempster, at that moment decided he wanted to take it upon himself to get more involved in the theatrics of it all than actual baseball. I guess that’s what happens when you haven’t been involved in too many pennant races in-season in recent years. Still, as a player rep, a veteran, and a guy the Red Sox brought in for a lot of money you should know better. No matter how maddening the situation with Rodriguez is or how mush of a moral stance you decided you were going to take you did it to the detriment of your team. These Red Sox didn’t deserve that. Not with crucial upcoming series against Los Angeles, San Francisco, Chicago, Detroit, Tampa Bay, and Baltimore. What happens if this gives the Yankees the chip on their shoulder they need to make up the 7.5 games in the division they need? What happens if they stay hot behind the motivation and erase just the six games separating them from a Wild Card spot? Sure this is all speculative, but do not forget the Yankees have one starter (Phil Hughes) who has pitched poorly, and their lineup is starting to get healthier around, well that man again. I’ll tell you what needs to happen from this point forward. Dempster needs to pitch like a man more concerned with getting his team back to the playoffs than a man concerned with Alex Rodriguez and his exploits. His teammates had better pull him aside and let him know that it isn’t their focus this season. 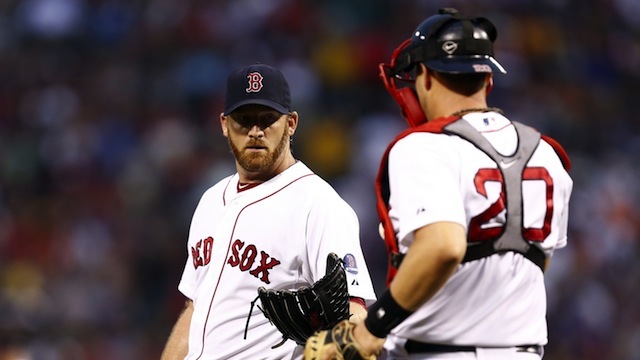 And Dempster had better listen, or the story will be a lot different for him than he anticipated.